I make personalize gift bags for all occasions. 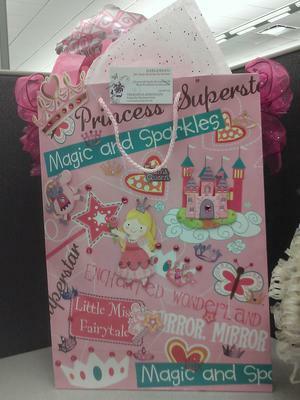 This bag that I have attached is a Girls Birthday bag theme "Princess". What I've done is I took a original gift bag and designed it with all princess crafts. I took ribbons and formed them into bows and stapled them on both sides of the bags. I took pink white and glitter gift tissue and folded them in to triangles and place them inside at different angles. I purchase a small princess hand held balloon and place half way in the bag. I then placed inside glitter, white & pink rose peddles as a added touch. On the outside I place different craft items on the bag, a full body princess 3D stickers, some multi color rhinestones all over the bag. I added glitter on the outside. I also added other princess stickers. I added sticker words that express the theme of the bag. I also added the birthday girl name on the back of the bag and in the card part of the bag. I also made a homemade card to go inside bag that match the princess theme. I added a crown and a princess wand.